What are profits from a perspective of accounting and cash flow? Cash flow from investing – records the purchase and sale of operating assets and financial assets, like the buying of a car for the business. 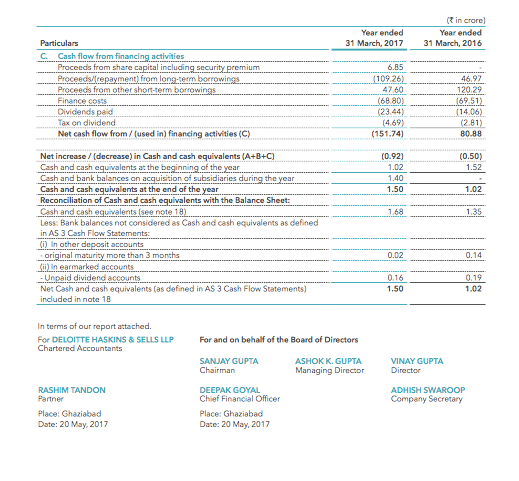 Below is the sample cash flow statement of APL Apollo tubes for FY17. As can be seen from the above, APL Apollo recorded cash flow from operations (CFOs) of INR 338 Cr, net profits during the same period was INR 146 Cr. The cash flow from operations or cash profits are more than double of the net or accounting profits posted by the company. Companies that have higher cash profits than accounting profits are better placed than companies where the accounting profits are higher than the cash profits. But why is it so? Accural accounting is a method of accounting that allows revenues and expenses to be recorded when they are incurred, regardless of whether cash is exchanged. For E.g if a company made total sales of Rs 100 and Rs 30 worth of goods was sold on credit. Rs. 30 is a “sale” but the money hasn’t yet come, it’s a credit given to the customer to pay later. Accrual accounting allows the company to record Rs 100 in the profit and loss account as revenue, even though the company has only received Rs 70 as cash, Rs 30 will be recorded as receivable in the balance sheet. There may be a case where companies may be aggressive and make higher sales on credit, build up large amounts of inventories on the balance sheet, in these cases accounting profits will not give the correct picture of the earnings of the company and hence arises the need for comparing accounting profits with cash profits. Cash is the lifeline of every business. Companies generating higher cash have the freedom of investing in their business without external debt, returning monies back to investors in the the form of dividends or share buybacks and reducing existing debt. Cash flow from operations tracks the actual flow of cash in running the day to day business operations. Few adjustments are made to the profit before tax (PBT) to arrive at the final cash flow from operations or cash profit figure. What are then those adjustments? For E.g a company had inventories of Rs 1000 at the beginning of the period and ends with Rs 1500 of inventories at the end of the period. There has been an increase to the tune of Rs 500 in the inventories. Company will have to make arrangements to the tune of this amount to stock this inventory and hence Rs 500 is deducted to arrive at final cash profit figure. On the other hand if their is reduction in inventories then cash is freed in this asset and can be used elsewhere, and hence a reduction in inventory is added back. However in the case of payables or other current liabilities it works oppositely. If a companies payables increase from Rs 1000 to Rs 2000, the difference of Rs 1000 (2000-1000) will be added back to arrive at the final cash profit amount. In this case the company has bought inventories and not paid for the same, it is the suppliers who are funding the inventories and to this extent the company does not have to invest resources in its business. 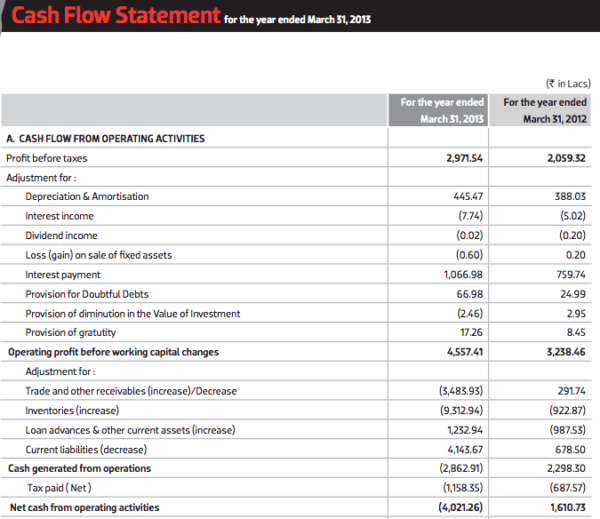 Lastly, taxes that the company actually pays is recorded here to arrive at the final cash flow from operations figure. Given the importance of cash in every business, investors must analyze how fast the accounting profits are getting converted into cash.If the company has higher cash profits when compared to the accounting profits, the company is running its operations very efficiently and can use the cash generated from operations to buy assets or pay down debt and dividends to share holders. However what happens if the accounting profits are greater than the cash profits? Let us take an example of a company meeting this condition and listed on the Indian stock market. Lux Industries is manufacturer of innerware products. The cumulative accounting profits of the company for the period (FY10-17) was INR 238 Cr, as compared to the cash profits or cash flow from operations of INR 3.14 Cr in the same period. In the 8 year period above, the company has posted negative cash profits in 5 years. It is advisable that investors analyze these profits over longer periods of time, as analysis of figures over shorter periods of time may not give an accurate picture. Before we find out what happened in the case of Lux Industries, what are the scenarios in which the accounting profits may be higher than the cash profits? 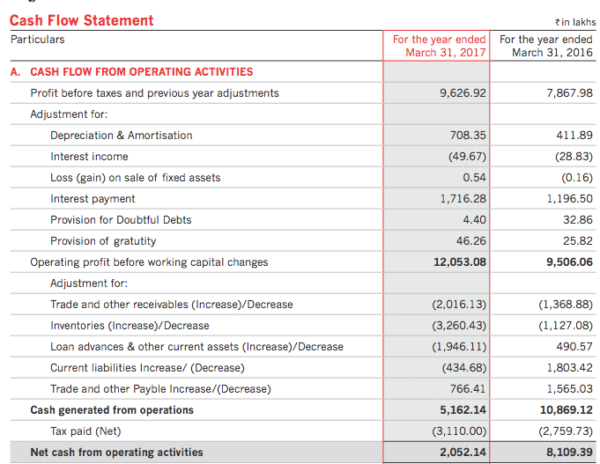 We looked at the cash flow statements of Lux Industries for FY13,16 and 17. It is the working capital in all the cases that has lead to the cash profits being below the accounting profits. 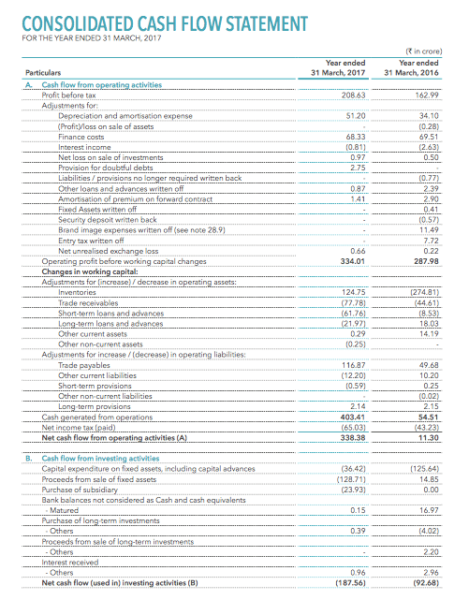 Take the case of FY13, the cash profits were INR -40.21 Cr versus net profits of INR 20 Cr, looking at the cash flow statement one can see that inventories and receivables have increased by INR 128 Cr and this has lead to cash profits being negative. In FY16, the only year in the 8 year period where cash profits are substantially higher than the net profits, it is due to increase in trade payables and current liabilities that have lead to higher cash profits. In FY17, depreciation and interest charges that have been added back are higher than the previous year, however it is working capital – receivables, inventories and loans and advances that have increased and lead to cash profits being below the net profits. The loans and advances have increased by INR 21 Cr, it is items like prepaid expenses, advance to suppliers and other loans and advances that have lead to this increase.Hence majority of the times it is the working capital changes that leads to the deviation between the cash profits and the accounting profits. What are the repercussions if companies are generating negative cash profits or not enough cash profits from the business? Companies will not able to invest in the business, will not able to service debt and pay dividends to its shareholders. They will have to resort to debt to fill the shortfall if the company is generating negative cash profits. In the case of Lux industries debt has increased from INR 131 Cr to INR 225 Cr in the FY11-17 period. We cannot stop emphasising the importance of cash flows with special attention to cash flow from operations or cash profits. Some companies even generate cash profits and then reinvest those profits into newer assets – like Amazon, which had for a long time generated very little accounting profit (or actually, had accounting losses) while having positive operating cash flow. Some others have “fake” profits through shady receivables, where they record sales but don’t actually receive the money – and sometimes never do. One way to find this out is to compare cash operating profits to reported accounting profits – and look at cumulative numbers over years. Things may not be as good (or as bad) as regular accounting suggests.